The Bank of England's deputy governor has said the outlook for the UK economy in 2008 has "changed dramatically". 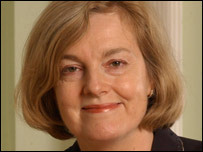 Rachel Lomax said there was uncertainty over the full impact of "the largest ever peacetime liquidity crisis". The deputy governor believes the credit crisis will significantly reduce demand over the next two years. Inflation is also forecast to rise more sharply. Ms Lomax warned this may lead to higher interest rates than expected if prices and wages rise further. Ms Lomax said the global financial crisis would act as "a significant drag" on demand in the economy over the next two years. In a speech to the Institute of Economic Affairs, she said the situation could be even worse than expected. There is a risk the financial crisis will "persist and possibly intensify", she warned. There is also the possibility that house prices and stock markets will fall, reducing demand and driving down inflation. Ms Lomax admitted the economic models usually used could not help to identify the extent of the impact of the credit crisis. The other major economic concern Ms Lomax identified was rising inflation. Higher utility bills are set to push up the Consumer Price Index (CPI) from next month. "Its implication for policy depends on whether people recognise the temporary nature of the pick-up in inflation," she said. "If price and wage setters start to expect higher inflation to persist, then the committee will need to restrain demand." The remit of the Bank of England's interest rate-setting Monetary Policy Committee is to keep inflation at 2%.